(This article was written by Nate Sanderson and originally appeared on Breakthrough Basketball. Nate is a great friend of Changing The Game Project and coach of the Iowa State Champion Springville Girls Basketball Team. We highly encourage every coach and parent to read this and institute this in your team). For the past 14 years I have began every basketball season by conducting a parent meeting. Every one of those meetings had one goal in mind – to insulate myself from parent complaints. I’ve used all the standard approaches to communicate our policies and expectations verbally and in writing for players and parents prior to the season. Our 33-page player manual includes information on our coaching philosophy, coaching backgrounds, game day expectations, eligibility policy, “Who Starts and Who Plays,” how we make team assignments, lettering requirements, travel expectations, practice rules, charts with off-season hours and shots taken, and more. 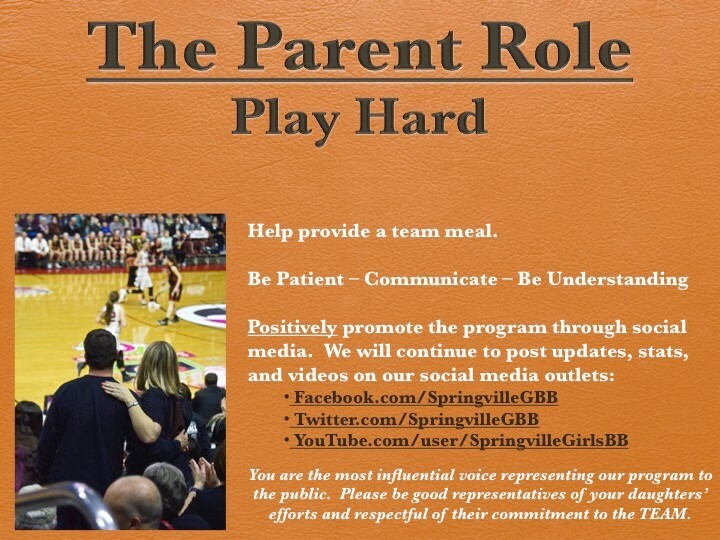 The purpose of every single item in our manual is to communicate as much information up front as possible so that we will not have to deal with the parents once the season begins. Interestingly, this is how the parent-coach dynamic is always described. Attend a clinic on the parent-coach relationship, take a coaching class, or have a conversation with coaches from any sport, and the phrase is always the same. 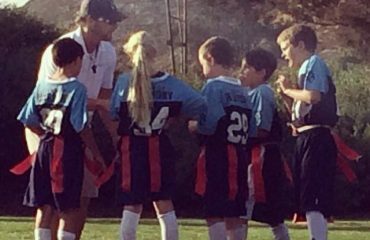 It’s assumed that if you want to get into coaching, you’re going to have to deal with the parents, plain and simple. Going into this season I started thinking a lot about that phrase, dealing with parents. Generally speaking, we never have to “deal with” things we like. In fact, the very notion of dealing with something invokes feelings of negativity, suspicion, and even dread. We usually deal with things that are unpleasant. We deal with problems. We deal with difficult people. With all those negative connotations, it’s safe to say, nobody ever looks forward to having to deal with anything. That likely describes how most coaches approach the parent-coach relationship. Rooted in fear of conflict and confrontation, we negotiate parent interactions like tiptoeing through a mine field hoping to spend as little time as possible desperately trying to avoid an explosion. At the end of the day, we signed up to coach a sport, not to deal with parents. In thinking about this, I began to wonder how much this approach to the parent-coach dynamic prevented me from forming positive, constructive relationships with the people who influence our players as much as anyone. I would never walk into a practice thinking, “Today I have to deal with these players again.” Rather, we strive to appreciate, love, and encourage our players every day. That’s our focus going into every practice. What if we approached the parents the same way? 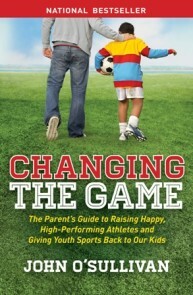 What if we chose to stop dealing with parents, and tried to coach them instead? This year we decided to do something completely different during our parent meeting. We still took a few minutes to address important issues such as “Who Starts and Who Plays,” but we spent the vast majority of our time doing something far more important. We invited the parents to participate in our culture. This phrase defines everything we want to be about as a team. It is our identity. Over the years, we have become increasingly deliberate in teaching our players specific behaviors that demonstrate these values. This year, we decided to do the same for the parents by giving them specific things they can do to participate in our culture. We felt it was important to not only invite our parents to participate in our culture, but to coach them in how to do so just as we do our athletes. Then we did something crazy. We asked the parents what they think. Never in my career have I asked a parent what they thought about our basketball program, or what they want their daughter’s experience to be like. I just wanted to avoid the minefield, remember? The more I thought about the sports parent experience, the more I realized, I have no idea what the parents want their experience to be like. So, we created an exercise to find out. Here’s what we did. Each parent was asked to put their name on three different note cards. They would answer a different question on each one, then leave the cards for us to read after the meeting. Then I walked them through each question. Card 1 (front) – Write at least one reasonable, measurable goal you have for your daughter this season. Card 1 (back) – Write at least one reasonable, measurable goal you have for our team this season. The purpose of these questions is to determine the parents’ expectations for the team, and for their daughter. If we found something that was clearly outrageous, we knew to address those in a non-threatening way sooner rather than later. The vast majority of the conflict we experience with players and parents is the result of unrealistic expectations. This was a way to identify those so that we could disarm them before the season even started. Then we asked the most important question that nobody ever asks: What do you want if you can’t have what you want? Card 2 – What do you want your daughter’s experience to be like if she CAN’T accomplish any of the goals you wrote for her, or for the team, on the first card? This question is one of the most significant questions that parents and players should explore. Essentially, we are asking them to consider what will make the basketball experience valuable even if they do not accomplish their goals. 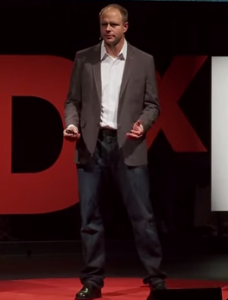 What will make basketball meaningful regardless of outcome? I want my daughter to grow inside. I want her to care, really care, about others. I want her to be less self-absorbed and more others-focused. A true team player… with heart. One who always does her best and NEVER gives up. I want her to be accepted and feel she belongs. I want her to continue to give 100% and understand that when you don’t succeed right away you just don’t give up. It is okay she’s not the star, there are other important roles on a team. To walk away from your season filled with memories, friendships, and walk always learning and improving at the game. Take away some life lessons. Learn how to be happy and work through things. To grow as a team – to play as a team – to have fun! I want her to be happy with herself and to know she gave it her all. To be a positive teammate! To have a fun experience and build great memories, memories that she will remember as fondly as a state title. To be as coachable as possible. I want to see her have fun and be looking forward to playing again next year. I want them to crate memories that will last a lifetime, friendships that will continue into old age, and life lessons they will take with them after basketball. Just want her to feel satisfaction that she knows she’s done her best, and confidence of being a great teammate and player. 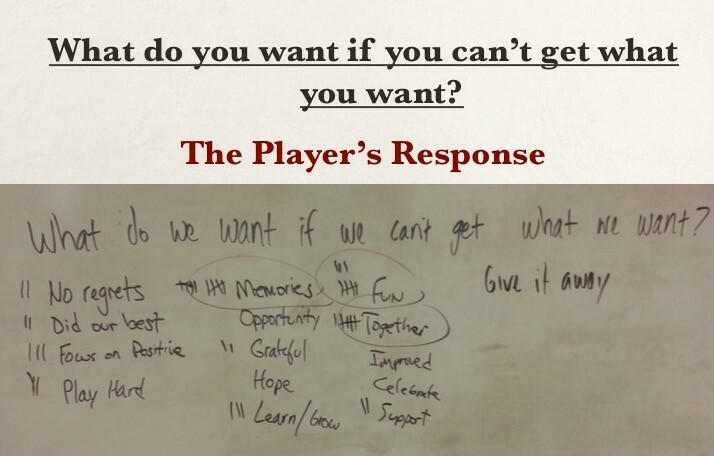 Before we moved to the final card, we showed them what the players wrote in response to this question when we did this activity with them last summer. 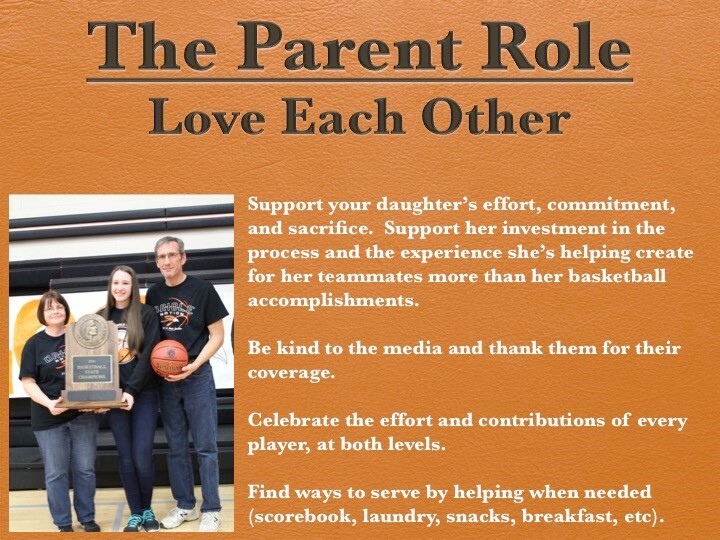 We are the defending state champions, but we want our season to be about much more than winning another state title, and this question helped parents think about what they really want for their daughter to gain from her basketball experience. Card 3 (front) – What do you want your experience to be like as a sports parent? In many ways, the purpose of this question is to validate the parent experience. It acknowledges that parents will have a unique experience in the stands, and provides them an opportunity to think about what they want that to be like. I would like to enjoy the game whether we are winning or losing. This is easier when everyone is cheering for the team and not criticizing the players. 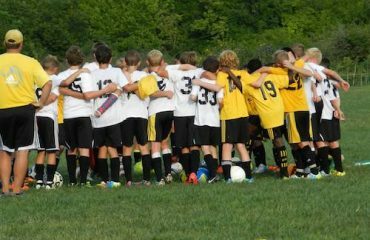 I would like to feel part of the group, accepted and liked by coaches, parents, and teammates like family. To enjoy the game without negativity from the coaches / players / fans when things aren’t going as planned. To have fun watching the girls play. I want to get to know other parents as the season progresses, and would like it to feel like family. Growing together as a community of parents – creating our own memories. Be a place where everyone wants to be. Relaxing & enjoyable to watch games. Positive comments toward players, coaches, refs, etc. To be able to ride along with the experience. Enjoy the ride. Interestingly, many of the parents wanted a similar experience as the players. They want to have fun. They want to belong. They want to be in a positive environment. It was important to let them create a vision for what they want to their experience to be like together. Then we asked them how to do it. Card 3 (back – left half) – What can you do to help create that experience for other parents? Be positive ourselves. Congratulate other parents on their children’s performance. Make sure every parent is involved. Be excited and have more people join in. Trust that the kids are doing their best. Be supportive. Listen. Have fun. Be sociable and volunteer for extra activities as needed. Be positive and cheer for the team, not just my daughter. Be positive fans for all the players. Share pictures and stories about fun moments. I am supportive and encouraging, and will do my best to promote unity. Congratulate other parents when their daughter does something well during the game. Help others see that our kids are learning more than just basketball. 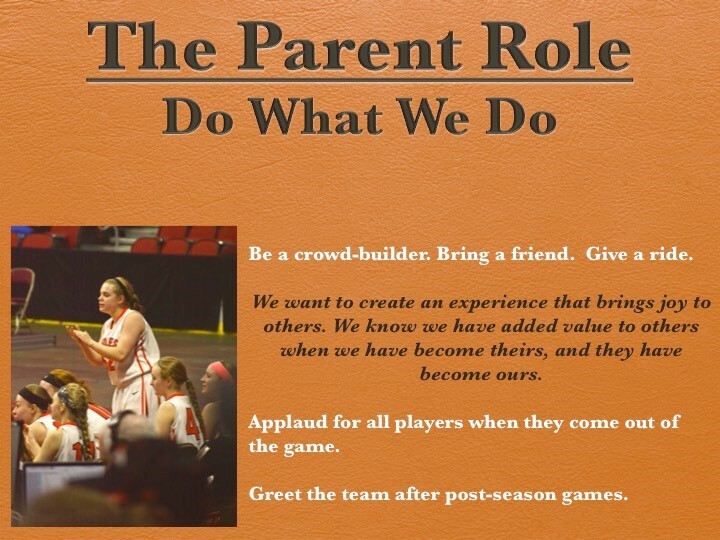 Just as we encourage our players to find ways to create a positive and meaningful experience for their teammates, we encourage you to do the same for your fellow parents. If you can be faithful to the things written above, I have no doubt that your experience will be a special one together. Card 3 (back – right half) – What can the coaches do to help facilitate that experience? This question beautifully combines the need for parents to be accountable to one another with the importance of coaches being vulnerable to receiving feedback. By opening ourselves up to criticism in a constructive we were able to build trust particularly as we follow through on some of their suggestions. Perhaps the best part was that parents were comfortable giving us feedback on a card that had their name on it. Too often parent complaints are anonymous, or done to everyone but the coach in fear that the coach will retaliate on their daughter. The willingness of parents to take ownership of a potentially negative comment was incredibly meaningful to our coaching staff because it communicated trust. Help them learn life lessons and be positive people. Support and understanding for me, and encouragement for my daughter. Keep teaching the girls the meaning of team and to enjoy the opportunity they have. Continue helping through your experiences and continue coaching the way you do. I enjoy all the YouTube videos that are put together an shared on social media. Look for individual needs from the girls (meaning to help them stay positive by coming up with little things and sayings to help them out of a slump). Communicate (which you are good at). Remember that I would like to spend time with her too – get out of practice on time so there is still time with family. Just engage in short conversations from time-to-time. Have a positive relationship with the team so they can come to you if they are unsure on things. Coaches will always have their favorites but they should not show it. Remember that there are more kids on the team than just your starters. They all need attention. They will be happier about basketball and make life at home happier. This feedback was encouraging, and incredibly insightful. We choose to embrace those few comments that could be perceived as critical because they help us to become better coaches. The best part of this entire process is it provides us a road map for building trust. The feedback we received from parents after this meeting was tremendous. Many called it the best parent meeting they’ve ever been to. I hope that they felt valued as we helped them think about what really matters beyond the outcome on the court, and as we welcomed their feedback to help us provide a better experience for everyone. Does this mean we will never encounter another difficult parent? Probably not, but when that day comes, our hope is that trusting relationships will be in place that can weather disagreements. 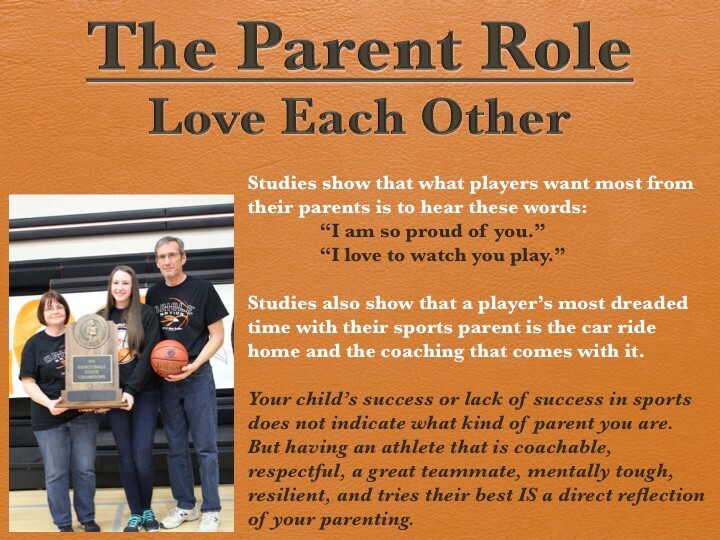 Regardless, we will choose to coach the parent with love, understanding, appreciation, and encouragement just as we would one of our players because our days of dealing with parents are over. Coaches, a Little Common Sense Please! unglued at the drop of a hat; these parents struggle to cope with the resulting chaos. Believe it or not, there are ways to help eliminate tantrums from your daily life. It starts with understanding the meltdown.